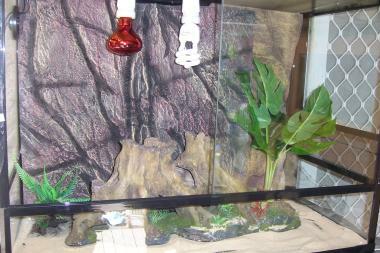 Brand new wooden reptile enclosures, Save heaps of power around 70% more efficient then a glass inclosure. Comes fully painted and sealed comes with your choice of three different backgrounds even the roof is painted blue so it looks like the sky, 6mm sliding glass door to help keep the heat in, UV light, heat light and thermostat included, all you have to do is plug it in ready to go totally stackable so you can go 2'3'4 high whatever suits you. Glass stackable enclosures also available if you prefer from $330 Best quality guaranteed completely set up.